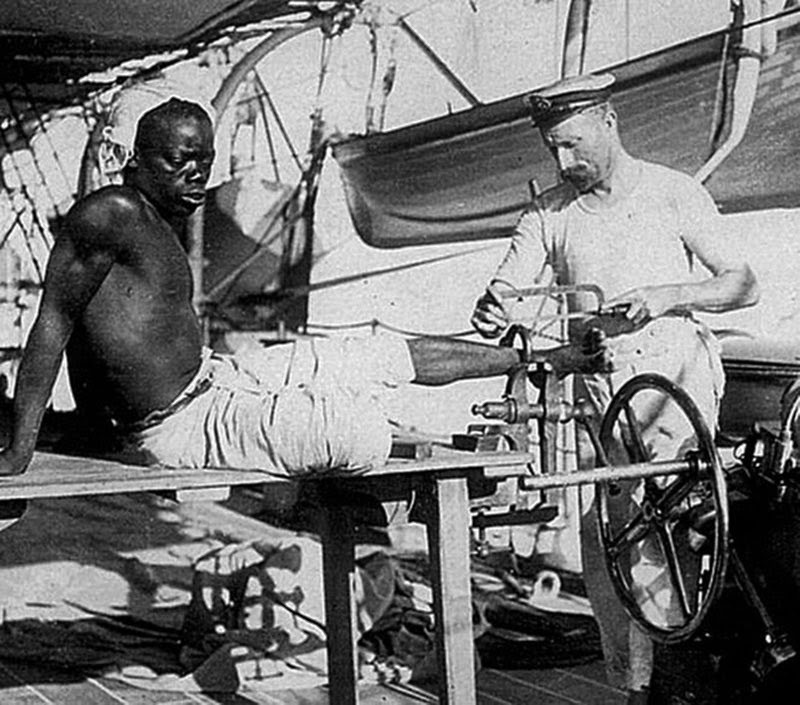 A British blacksmith removing the leg irons off a slave, 1907. This photograph shows a sailor removing the manacle from a newly freed slave. The picture is part of a small collection donated by Samuel Chidwick to the Royal Naval Museum in Portsmouth. His father Able Seaman Joseph Chidwick, born in 1881, was serving aboard HMS Sphinx. 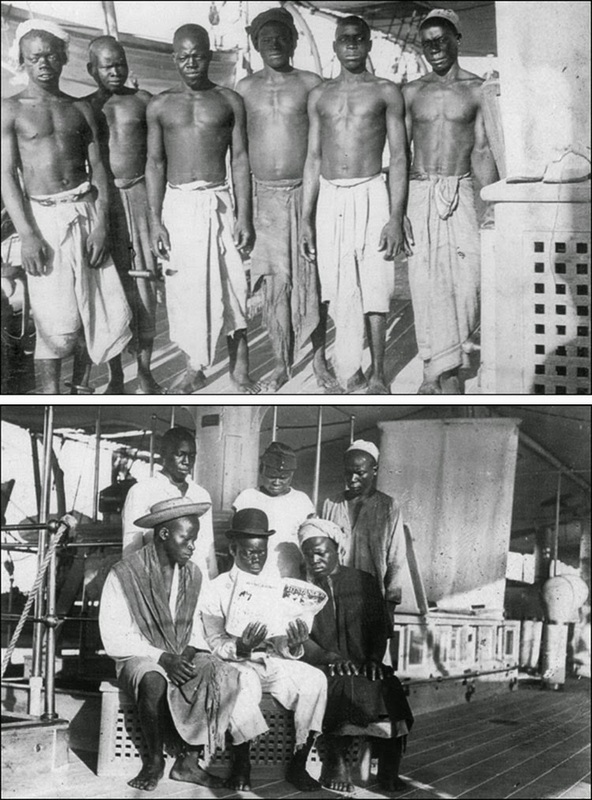 The Africans featured in the photos escaped in a canoe from a slave-trading village on the coast on hearing that the Royal Navy ship was in the area. 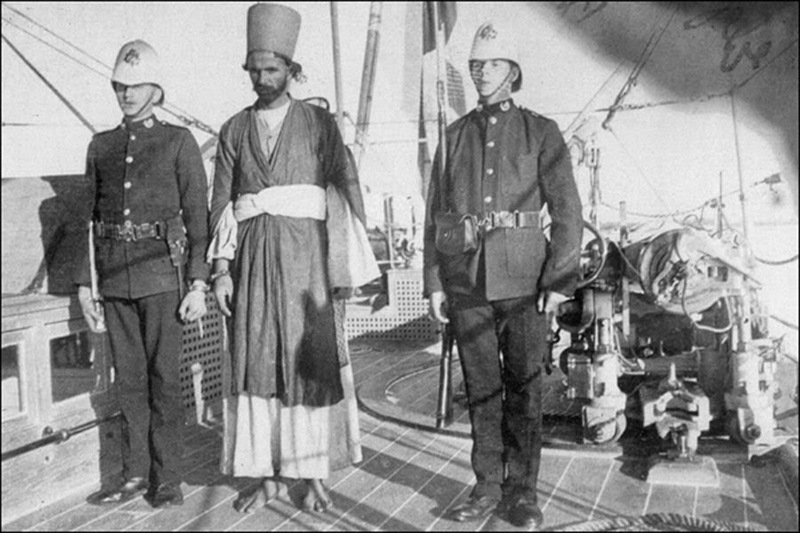 In his report dated 15th October 1907, Commander Litchfield wrote that the ship received ‘six fugitives’ on a cruise off the Batineh Coast, Oman between 10th and 14th October. One of the fugitives had been manacled for three years and had escaped with his leg irons still on. Samuel Chidwick said: “The pictures were taken by my father who was serving aboard HMS Sphinx while on armed patrol off the Zanzibar and Mozambique coast in about 1907. They caught quite a few slavers and those particular slaves that are in the pictures happened while he was on watch. That night a dhow (sailing vessel) sailed by and the slaves were all chained together. He raised the alarm and they got them on to the ship and got the chains knocked off them. They then questioned them and sent a party of marines ashore to try to track the slave traders down. They caught two of them and I believe they were of Arabic origin. My father thought the slave trade was a despicable thing that was going on, the slaves were treated very badly so when they got the slavers they didn’t give them a very nice time”. The saved slaves on board of HMS Sphinx. The crew gave them new clothes (second photo). An Arab slave dealer in custody. The Royal Navy, which then controlled the world’s seas, established the West Africa Squadron in 1808 to patrol the coast of West Africa, and between 1808 and 1860 they seized approximately 1,600 slave ships and freed 150,000 Africans who were aboard. Most of the ship captured were headed to South America. The first stop was always South America after Africa. This was mostly due to Brazil being the biggest importer of slaves and also due to the trade winds and a ships inability to sail directly to North America. Brazil was the largest importer of African slaves during the slave trade era and was also probably the worst in terms of treatment of their slaves. Nonetheless, despite laws banning their importation, between 1808 and 1888 more than a million new slaves were forcibly shipped to Brazil. The House of Commons passed a bill in 1805 making it unlawful for any British subject to capture and transport slaves but the measure was blocked by the House of Lords and did not come into force until March 25, 1807. An 1807 Act of Congress technically abolished the intercontinental slave trade in the United States but the ban was not widely enforced and many of the slave ships which escaped the blockade were destined for the southern United States. The internal trading continued, until the Civil War ended that. he is not Turkish my friend.. In the first picture the iron looks large enough to slip off the foot. It makes me wonder if the photo was staged. Although there is a space showing through the top part of the leg iron, the rest of the leg is crowded in on, locking the man in tight.